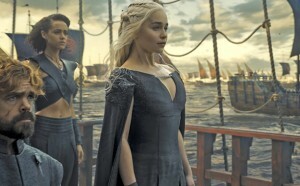 On the heels of their second consecutive Emmy win for Best Television Drama, Game of Thrones showrunners and author George R.R. Martin made some comments on the potential of a prequel. David Benioff, D.B. Weiss and George R.R. Martin were all on hand backstage to talk to the press about their big win and discuss the future of the franchise. You might want to ask George about that. It’s a great world that George created. It’s a very rich world. I’m sure there will be other series set in Westeros. But for us, this is it. I do have thousands of pages of fake history of everything that led up to ‘Game of Thrones,’ so there’s a lot of material there and I’m writing more. A prequel would definitely be exciting but I have mixed emotions of the franchise continuing without Benioff and Weiss. HBO has been relatively silent on the matter and has not confirmed or denied the potential of a prequel. What do you think? How do you feel about a prequel? Can we get the Winds Of Winter first though? Sound off below! Watch HBO scramble to make a GoT prequel if Westworld doesn’t hit as big as they hope, and in record time. It sure won’t be as big a hit as GoT was. Not feeling Westworld, either.